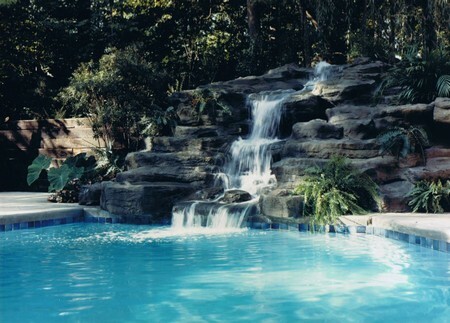 The waterfall not only stimulates, rejuvenates and enlivens the milieu, but also generates a relaxing effect that annihilates all kinds of stress, tension, anxiety and angst. It can be easily and inexpensively built in any region of the house like garden, patio, terrace and the like. 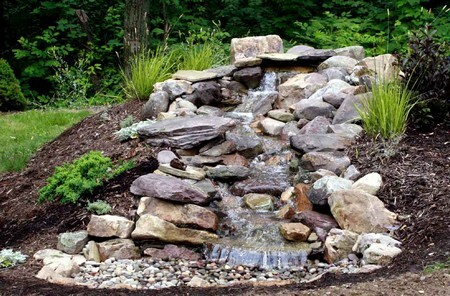 Here is a stepwise procedure to build a waterfall in the garden. Normally, rocks and concrete are used for building a waterfall. Re-constituted rocks and preformed units made of cement, plastic or fiberglass can also be used. The preformed units are light-weight and easy on the pocket. Moreover, they are available in a wide variety of shapes and sizes. An appropriate location has to be selected for the pond and waterfall in the garden. If the pond is already there, then all that is left to be done is to build a waterfall. Assuming that the pond exists, start building a mound of soil for the waterfall. Ensure that the mound gradually slopes down towards the frame of the pond. In the mound the pre-formed units have to be fixed and for them level-pockets have to be created. Make sure that the units are properly aligned and their lips overlap with one another. To test whether the units are correctly placed or not, release water from the hose. The water should flow centrally and there should be no seepage in the region where the lips of the units overlap. If there is any irregularity, re-adjust the tilt and evenness of the mound. Build temporary stakes on the outer edges of the units to maintain their alignment. Once the units have been properly installed in the mound, number them and thereafter remove them. Place the water hose over the mound and attach it to the submersible pump that is present in the pond. With the passage of time, the soil will settle down. For this reason, it is essential to keep the preformed units approximately 1-inch higher than one another. Sand can be used to provide additional cushioning. If the number of units is more than 3, then plastic liner should be used. The liner should be laid in such a manner that there is at least 2-3 feet overlap. At this point of time, the water hose should be placed along the sides of the pockets of the preformed units. Place small amount of cement mixture in each pocket and replace the units. Recheck the tilt and levelness of the units with the pump and water hose. Allow the cement to dry. Lastly, remove all the temporary stakes and soil packs, cut the excess plastic liner, and cover up the barren edges with gravel, boulders, rocks and plants. The waterfall is ready to perk up the beauty of the garden.